So I buy things because I want to post about them on Instagram… Sue me! But in all seriousness, I would be lying if I said there weren't a handful of items in my closet that Instagram didn't ultimately convince me to purchase. Here's how they get me—a trend starts to bubble up, cool brands put top-notch influencers in said trend, the influencers post about it profusely and by the sixth or so post I see, I'm convinced I also need to buy and post said trend. If I don't, am I even cool? Am I even on trend? Do I even work in fashion? Apologies for the dramatic rant there—those are just the thoughts that I think when contemplating whether or not I should invest in a trend. If you don't want to, that doesn't mean you aren't cool, or on trend, or fashionable. I'm just a nut-case. There's definitely a lot to unpack here though—the repeated presence of certain items on Instagram conditions us to think they're cool, and once you buy in, you feel this need to post about it so other people will think you're cool too. Meet the power of social media. Love it or hate it, it's now a huge aspect of the fashion industry, and I don't think that's a bad thing. Thanks to this platform, we have access to brands we might have never discovered on our own, can connect with people to further educate our shopping decisions, and can see how people around the world are dressing. Below is an example of a few items I was swayed to buy thanks to Instagram, and I have absolutely no shame admitting that. Do I let social media dictate my worth? No. Do I only buy things to post them on social? No. But I do think it's fun to participate in bubbling trends and share them on my personal accounts. Main takeaway: I think it's fun, and that's what really matters to me. I've never wished to be a skater girl more than I had these past few months. Between the skate-inspired graphic tees, the return of utility pants and most importantly, these seatbelt belts, I think my future in the skate world is looking pretty bright. Suits are definitely a trend that extends beyond just Instagram, but in my small Instagram bubble, it seemed like every single fashion girl I followed was taking the trend to the gram and posting look after look in a cool new suit. Naturally, I followed along and participated in the movement. Fun fact: This bum bag is not actually mine, but I've wanted it for so long. So one day, when I was leaving the office, I saw this bad boy sitting on the front desk and naturally had to try it on and snap a pic. While I still am unsure whether or not I can pull off this hypebae trend, I fully support it and am still in the market for a bum bag that suits me. "Ugly" or dad sneakers are a trend that has yet to lose steam. Between the return of cult brands like Fila and the obsession with Nike's Air Max 97s, the Instagram content this sneaker trend has created is impressive at best. Do I think these sneakers necessarily fit my personal style? I couldn't tell you, mainly because my style is changing all the time, and the addition of these sneaks to my closet was proof of that. The day I bought this bag might have been one of the happiest shopping days of my life. It was last summer (an important note because I carried Susan Alexandra bags before every major influencer did… just saying), and I walked into Opening Ceremony, saw the bag basically beckoning me and purchased without a qualm. Ever since, the unique carryall has been the Instagram prop I use on repeat, along with the rest of the world. 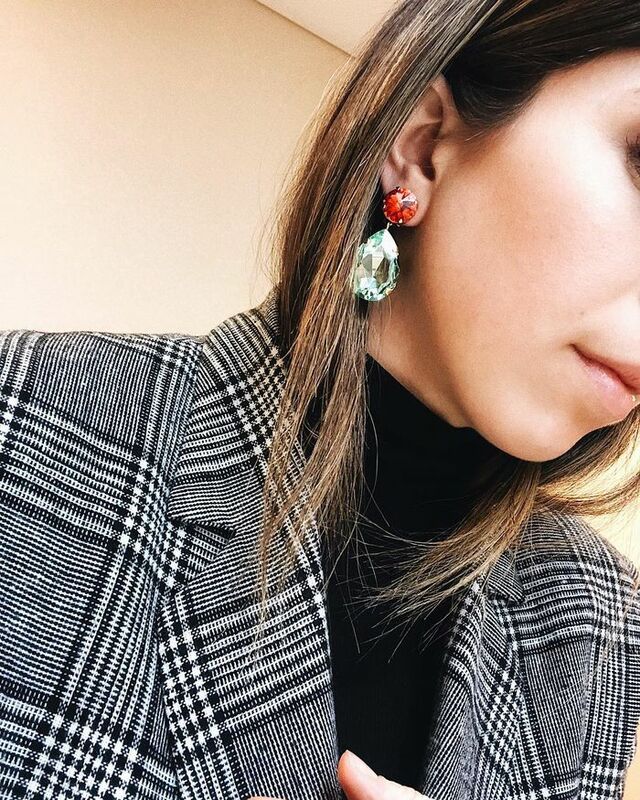 Roxanne Assoulin has without a doubt changed the definition of "Insta-candy" with her sparkly, über-colourful crystal jewellery. My personal favourites are of course her drop earrings. I saw all of my favourite fashion girls posting about them on Instagram and naturally had to get my hands on a pair of my own. Ask me how many times I've posted a pic in them since (see here, here and here). Beyond that, unique jewellery brands have been coming out of the woodwork presenting 'grammable ear candy I need immediately. Wild prints are basically the ready-to-wear gems of Instagram. Between stars, polka dots and aesthetically pleasing gingham, you basically didn't even wear the prints if you didn't post about them, and that's a fact. Shopper bags have been spotted all over social media, street style stars and beyond. Currently, the plastic version of this trend is on my wish list, but my little Poppy Lissiman thank you bag is doing the trick for now. I hope you enjoyed this journey through my Instagram obsessions. Surely there there will be more trends I buy into thanks to Instagram in the near future.